Parthinia is a nonindustrial world, that requires extensive imports of outside technology to maintain a modern, star-faring society. 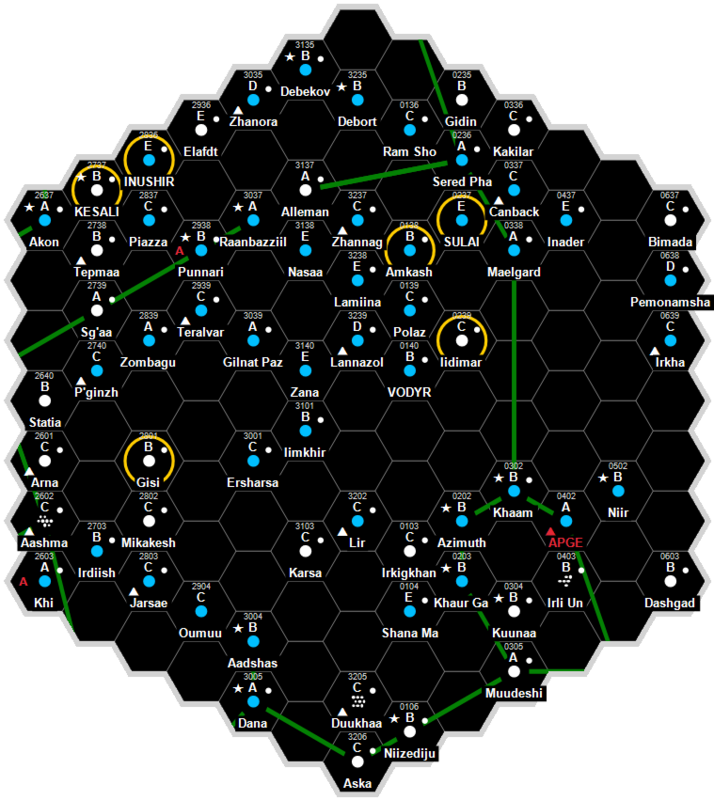 It is a Non-Aligned world dominated by human sophonts located in the Fessor Subsector of Foreven Sector. Parthinia is home to the Issugur, a Minor Human Race apparently planted here by the Ancients 300,000 years ago. The Issugur have a primitive, low tech, agricultural society. The Starport city is built over the top of a large mining complex and houses 50,000 transients, most of which work in or support the mining industry. Offworlders live and work in the starport or the mines below, they are governed by 'The Council'. The Council is divided on the subject of who to trade with, the Imperium or the Zhodani Consulate. Currently Tukera Lines is the main Imperial representative, although not in any formal capacity, while the Consulate is suspicious of Tukera's methods and would like to resolve the Council's conflicted opinions in their favour. Parthinia has a routine quality starport. Parthinia possesses a Technology Level of TL–12 or TL-C in Hexadecimal Notation. Parthinia has a Feudal Technocracy government. Parthinia is basically a one-city world, populated by all sorts of beings: Vilani, Vargr, Sword Worlders, and some others. Most are engaged in a successful deep mining operations performed on the low surface of the planet, under the thick veil of the atmosphere. Exports are iron and lanthanum. This page was last modified on 10 April 2019, at 14:30.